Wish to die statements are becoming a frequent phenomenon in terminally ill patients. Those confronted by these statments need to understand the complexity of such wishes, so they can respond competently and compassionately to the requests. If misunderstood, the statements can be taken at face-value and the practitioner may not recognise that a patient is in fact experiencing ambivalent feelings at the end of life, or they may misinterpret the expressed wish to die as a sign of clinical depression. Public debate about the morality and ethics of various end-of-life care options has exploded in recent years. However, it has never been sensitive to the finer aspects of clinical reality or the experiences of patients. The Patient's Wish to Die: Research, Ethics, and Palliative Care brings together that reality and the patient's voice, combining them with different research approaches. It presents the best available knowledge and research methodologies about patients' wishes at the end-of-life, together with a series of ethical views and a discussion about the clinical implications for palliative care. The book presents material in an open and unbiased manner whilst remaining sensitive to the spiritual and existential dimensions of dying, and to the different cultural views that provide meaning to the individual. 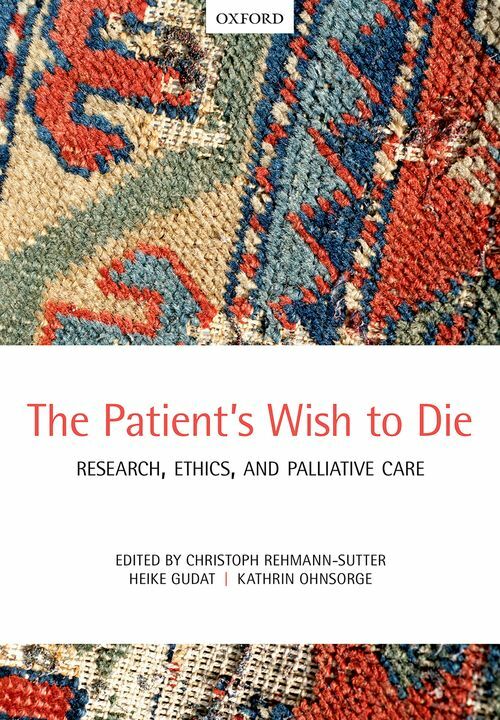 Written by the best specialists and ethics scholars from around the world, including palliative care practitioners and end-of-life scholars from countries where assisted dying practices are legalized and from those where it isn't, The The Patient's Wish to Die: Research, Ethics, and Palliative Care will prove essential reading for all those working or studying in the field of palliative care. Christoph Rehmann-Sutter is Professor of Theory and Ethics in the Biosciences at the University of Lubeck in Germany and is also a visiting professor at King's College, London. After a diploma in molecular biology, he studied philosophy and sociology. In 1996 he founded the Unit of Bioethics at the University of Basel, Switzerland, and he was president of the Swiss National Advisory Commission on Biomedical Ethics from 2001 to 2009. Current research interests include the anthropology of genomics, the ethics of transplantation of blood stem cells between siblings, and moral issues in end-of-life care. He has published more than 200 scholarly papers. ; Heike Gudat is physician and specialised in palliative care. Since 2000 she has been the medical head of the HOSPIZ IM PARK, an independent hospital for palliative and end of life care in the region of Basel, Switzerland. After medical education at the University of Basel 1988 she specialised in internal medicine, also experiencing the special fields of rehabilitation, gerontology and hematology. From 1992-1994 studies of experimental cytogenetics at the University of Lubeck (Prof. Ch. Fonatsch), supported by the Swiss National Foundation. Since 1996 specialisation in palliative care. Within regular teaching activities Heike Gudat has a teaching assignment for palliative care at the University of Basel. Together with Settimio Monteverde she developed interdisciplinary palliative care training courses for primary care professionals. Current research interests include wishes to die in end of life care situations and implementation of palliative care in family medicine. ; Kathrin Ohnsorge is a researcher in bioethics currently working at the HOSPIZ IM PARK, a hospice close to Basel in Switzerland. After her graduation in philosophy, she obtained a European Master in Bioethics from the Universities of Leuven, Nijmengen, Basel and Padua. From 2001 to 2012, she worked at the University of Basel in various research projects regarding ethical issues in end-of-life care. Her current research interests are in ethical issues in end-of-life care and long term care and in narrative and hermeneutic approaches to bioethics. She teaches also bioethics in two postgraduate programs at the University of Padua.